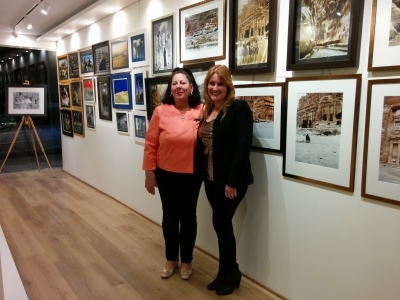 An interview of the owner of Govedarou Art Gallery and painter Natasa Govedarou was given to the journalist mrs Magda Mystikou during the solo photography exhibition of Alexandros Stefanatos. 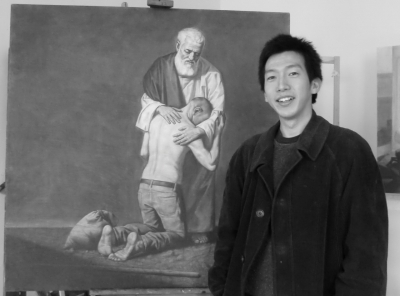 Giovanni Micico aspires to the realism of the souls through his figurative artworks. Just like William Shakespeare’s famous quote “The eyes are windows to your soul”, Micico wants his works to be “the eyes”. The stories of his work are about the transcendental moments that manifest and reveal the beauty and the poetry of the Creation that continues in our human life. With this story in his mind and heart, he brushes on a canvas gradually approaching to the concrete scene. Sometimes Micico’s works have a reference to a painting in the past on the same topic, for example, his “Return of the Prodigal Son”. Rembrandt created an unforgettable image on the same subject. Rembrandt almost sculpted out the emotions of the characters in the painting. Having inevitable comparison to the Rembrandt’s, Micico looked for a contemporary representation which is personal to him. He felt confined by having a fixed-theme though, it narrowed down to the essence he searched to represent; the state of a soul of the son. Micico believes that the originality is a key for narrative paintings which were already represented in the past, contrary to the idea which is often held by people; a repetition of the past. Working from life is essential for Micico’s work. He believes the most sincere expression starts from our perception and conception even in the form of realism. That way the realism also gives us a space for our spiritual, emotional, and psychological realms of being. We are inspired by seeing and we interpret reality by seeing it well. Together with our inventions and abstractions Micico aspires to represent and and offer those in his works. Micico draws influences from many masters of the past and the present including the compositional splendor of Raphael, Titian, and Caravaggio, and the profoundness and atmosphere in portraits by Velazquez and Rembrandt, Plein-air of Sorolla, Levitan, Zorn and Yimaukun. Musical and graphical elements of Hans Makart who inspired Micico on figurative compositions. At last, graphical layout of Hiroshige, the wood-block printmaker. Famous painter Gethsemane at Govedarou Art Gallery Gift shop!! 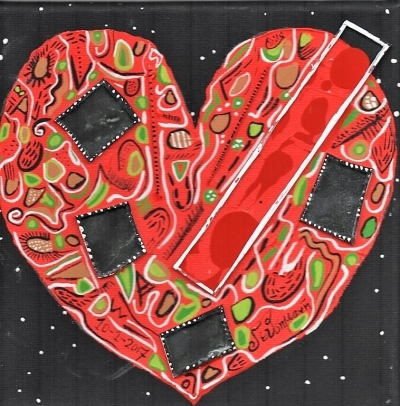 Jewllery and small paintings are now available for sale in our gallery shop! Best prices for famous artists artwork. 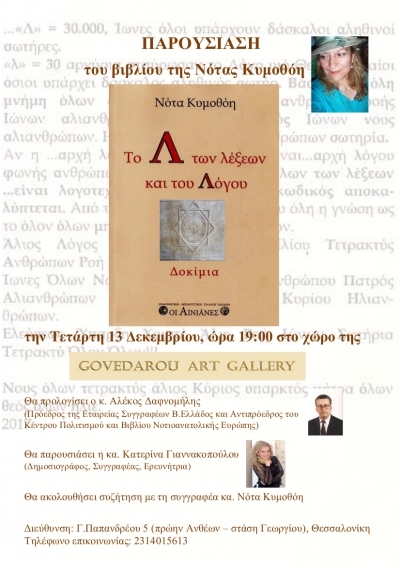 The writer Nota Kimothoi is presenting her book "The letter Λ of the words and speech"
Mr Alekos Dafnomilis (President of the writers of Northern Greece and Vice President of the Center for Culture and Books of southeast Europe) is going to present the book together with mrs Katerina Giannakopoulou (journalist, writer, researcher). Discussion with the writer is going to follow.